This book is beautiful. It combines grief and love ins such a real way that it feels like you are experiencing the world along with the main character Ryn. This book will make you feel all the feels and it’s so cool that it takes place out our local Denver Airport (conspiracy theories included!). It also references Tattered Cover, so you know the book has to be good! 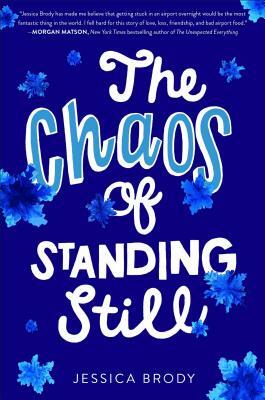 The Chaos of Standing Still is one of those books you didn’t know you needed to read until it was in your hands. With Jessica Brody’s amazing descriptions, intricate backstories, and loveable characters, this book is sure to be a hit. It brings you on a rollercoaster of emotions and overall makes you think about your life decisions. The book really helps bring focus to how you grief and handle the troubles that everyone experiences in life. Highly recommend. In The Chaos of Standing Still, Ryn struggls to move on from her best friend's death -- and that one unread message from her. At the Denver International Airport, Ryn manages to bump into a cute-but-also-hiding-a-secret boy named, Xander. As Ryn tries to move on from her tragedy, she is plunged into a series of adventures, including a New Year's Eve party and thinking about what happened to her best friend. Chaos gives you a sense of comfort. Set entirely in the Denver International Airport during a blizzard which shuts the airport down, The Chaos of Standing Still is an intricate, moving, funny, and thought-provoking story of coping with loss and allowing love to bloom. Underneath it all, conspiracy theories abound about the real-life and very weird paintings and sculptures at the airport. Brody is already well-established as a skilled writer of young adult and middle grade books, but this one is a real standout. Great for high school-age teens and many adults. The Chaos of Standing Still is a stunning portrayal of grief and loss, family and friends, and the seemingly small moments that shape our lives forever. Set in the Denver International Airport on New Year’s Eve, the story features a loveable and diverse cast of characters. The book is a perfect balance of humor, romance, and heart-wrenching sadness. Best of all, it will make you want to explore DIA--and there’s a shout out to the Tattered Cover! The Chaos of Standing Still is one of the best books of 2017.